Righteous Jews! We have rescued your brethren the best way we could, ourselves being exterminated in the combined Zionist Nazi and Judeocentric Soviet yoke. Why are you silent?! It’s your turn to rescue us Poles from this despicable campaign of hatred, calculated and waged by the Zionists, as in WW2! A Pole, I am relieved to find that the Zionist Jew “March of the Living” will cease, at last, in my home country. For years, escorted by armed Israeli security that has been very rude and hostile to the residents, the March has been a disgusting, violent demonstration of Zionist-driven hatred and Holo-lie against the same nation that has harboured Jews expelled from all over Europe since 13th century — hence Poland’s name in Hebrew: Polin. Under German Zionist Nazi occupier’s penalty of death for doing so, Poles have rescued uncounted Jews (we don’t count up what is normal among humans) persecuted by the Jew-Zionist Third Reich. In a token tribute to the Poles, the Zionist illegal entity in occupied Holy Land has recognized this fact by the most numerous trees of “Rightous Among the Nations” at Yad Vashem. Legal successors of Jew banksters and Zionists who have planned and orchestrated the Shoah and the Holocaust owe their most numerous victims, , Poles and other Slavs, compensation for WW2. More than 6 million Polish citizens perished in the combined — Zionist and Jew Soviet — vice, incl. assimilated and Orthodoź Jews who refused emigration to Palestine, while my country and nation suffered tremendous ruin… Tens of TRILLIONS of dollars altogether. Just for every million of citizens killed, you owe us 5 TRILLION dollars in today’s money. History and law need verified testimony, not nightmares. Too many “nightmares” have been fabricated by the Holo-Business and Holocaustianity Religion, whose “saint” Ellie Wiesel’s “memoirs” are just one example. Unlike any Zionist Jew-inspired law in Israel and in the West, the Polish law guarantees unobstructed scientific study and even an “artistic expression”, a case of which might be the chutzpah in front of the Polish embassy in the illegal, criminal Zionist entity occupying Palestine. A 93 yr old Shalom Shtamberg claims he’s escaped from a ghetto at the age of 14, i.e. 79 yrs ago, or 1938 to 1939 depending on the month. Which ghetto is he talking about? The Zionist Nazi Jews have started creating ghettos in occupied Poland beginning in 1940, with a few exceptions (about 7 out of 278) started after Hitler’s invasion of Poland in September 1939. Would Shtamberg please point to the Poles who allegedly have wronged him and other Jews. Shtamberg: after the Warsaw Ghetto was opened, “the SS and the Gestapo killed us and took us for hard work,” — What do SS and Gestapo have to do with Poles!? Is this how hasbara has influenced the Surviviors? Is Stamberg a genuine one? If Shtamberg was indeed in the Warsaw Ghetto and somehow escaped before the ghetto was set up by his Zionist tribesmen, how does he know what happened upon the ghetto’s “opening”? He would not last outside the ghetto without help from Poles, as he would be denounced by a Zionist Jew shmalcovnik to Zionist German Gestapo and re-sent to Zionist Nazi ghetto. If it indeed happened, wouldn’t he tell us about the terrible Poles more specifically? Where are his certified testimonies? He has had 72 years to do it. In the beginning, the ghettos have been a half-decent place to harbour the poor Jews until transfer to Palestine, Nazi Zionist Third Reich’s emigration goal. When the Zionist Nazis have failed to convince assimilated and Orthodox Jews to emigrate against their anti-Zionist belief, the Zionist Nazi regime of Germany has resolved at the Wansee Conference (20.1.194): Final Solution of the Jewish Question, i.e. extermination in death camps. What does it have to do with Poles? — Only that incoming Jews would see a lot of Polish inmates in the concentration/death camp they arrived at. Up to the time of Wansee Conference, millions of Poles and other Slavs have perished in Zionist German Nazi camps, most of them in Auschwitz (which name and symbolic meaning the Holo-hoaxers have appropriated exclusively for themselves, first falsifying the monument to this effect, and banning celebration of Polish, Russian and other Holocaust victims in recent years! “Every Passover there were pogroms against us, so the Poles were anti-Semitic and received orders from the Polish church,” said 80-year-old Shaul Gorka. A shameless lie, a spit in the face of Poles and Christians. If it was not for the Polish Catholic Church, there would be fewer Survivors. Many orphaned Jewish children in post-WW2 Poland received last names from the families that have adopted and protected the kids from the Zio-Nazis, e.g. a later traitor of the Polish National Interest, Bronisław Geremek (Berele Levartov). No historical evidence for Gorka’s contention. Should any evidence surface, historians will look at it, as written in Warsaw’s law on the subject. Certainly OUR historians will scrutinize YOUR pseudo-scientists of Jan Tomasz Gross ilk. I underscore OUR, as thrughout the post-WW2 period Jews globally, not only in Israel, under the Zionist rule have lost the remnants of credibility and trust we Poles have vested in them. “I only know one family in the whole village who helped me. All the rest didn’t care,” said 80-year-old Esti Lieber. Why didn’t they help Lieber? Perhaps they themselves were in mortal danger. The whole family, the whole village if uncovered by the Zionist Nazis in occupied Poland, faced death for harbouring or helping a Jew. Or the Liebers have earned a hatred of the village for denouncing say the Polish Underground fighters to the Jew Soviet NKVD. Have you walked under Polish rifles, they would have been captured by the Zionist Nazis and used in your camp (if you have been in any). If there were Poles around in the camp, they were death camp INMATES. Why have YOU not helped them, Rosenzweig? Have you helped any Gaza inmate Palestinian? Lucky you! Many Poles have been killed long before you arrived at Auschwitz-Birkenau. You have escaped from Birkenau near Auschwitz, which your Zionists have appropriated in recent years for your own Shoa that the Zionists have perpetrated! Never mind March of the Living… Poles are forbidden to commemorate their own martyrs in Auschwitz: no Catholic Mass, no Polish flags, no meetings — nothing! Once you’ve escaped, who gave you protection — Gestapo, SS, Jewish shmaltzovniks? Nazis masascred Jews on Polish soil — complaints to your Zio-Nazis who built them and operated on our soil, introducing a satanic spirit onto my ancestos’ lands forever. I am the first-generation Polish Survivor of your Zionists’ Holokcaust. I’ve suffered your deceitful, hypocritical Judas’ Holo-hoax hagada and sheiss like the present one and as a Polish researcher, author and publicist have extensively fended off these ugly lies aimed against my own, my parents, my ancestors and the whole nation’s! My children and grand-children have already been “educated” by the Holocaust Religion and Holo-hoax narrative, and will pay with the trauma of Polish Survivor-Turned-Holocaust-Perpetrator, and with payments for your perpetual “survivors”. Dozens of Holocaust survivors entered the Polish embassy compound in Tel Aviv on Thursday, waving flags and signs protesting the country’s bill making it a criminal offense to blame the Polish nation or state for the crimes of the Holocaust. The demonstrators, who also included younger Israelis, entered the embassy compound. They briefly rallied outside the embassy building, with security guards trying to prevent them from entering, and also surrounded a diplomat’s car. The protesters shouted “Nobody will forget what you did” at the diplomat inside the car, Ynet reported. 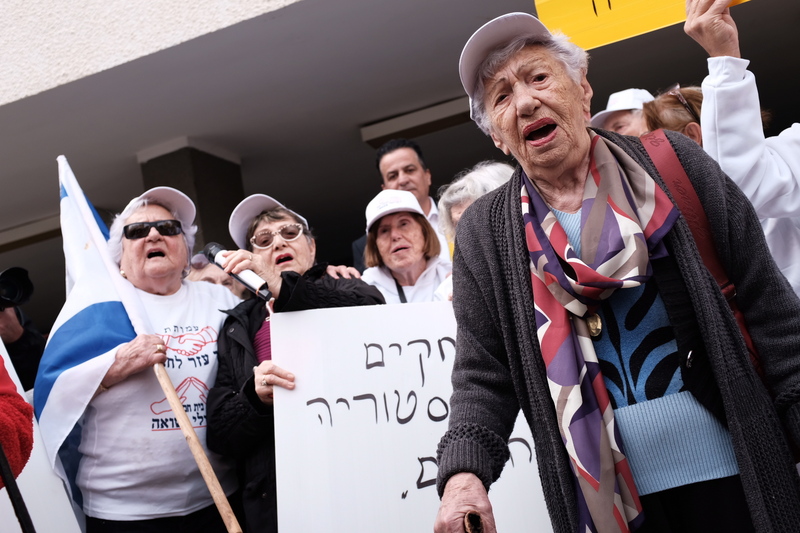 The rally was organized by the Yad Ezer La-Haver foundation, which runs a home for Holocaust survivors in Haifa. “We are here to voice our protest, and we promise it won’t be quiet,” said the foundation’s CEO Shimon Sabag. The demonstrators plan to erect a protest tent outside the embassy. Some Holocaust survivors, many of whom are over the age of 90, used the demonstration to tell chilling stories about Poles mistreating them during World War II. Holocaust survivor Shalom Shtamberg, 93, said much of his suffering had been caused by Poles. He said that after the Warsaw Ghetto was opened, “the SS and the Gestapo killed us and took us for hard work,” he said. After escaping the ghetto as a 14-year-old and eventually being sent to the Auschwitz death camp, “there were so many Poles there too who beat us and caused us trouble,” Shtamberg added in tears. The Polish bill, which was signed into law Tuesday by President Andrzej Duda but has yet to receive final approval from the country’s Constitutional Court, has sparked a diplomatic crisis with Israel. The legislation, proposed by Poland’s conservative ruling party, has angered Jerusalem, which says it will inhibit free speech about the Holocaust. The United States also strongly opposes the legislation, saying it could hurt Poland’s strategic relations with Israel and the US. As currently written, the legislation calls for prison terms of up to three years for attributing the crimes of Nazi Germany to the Polish state or nation. The bill would also set fines or a maximum three-year jail term for anyone who refers to Nazi German death camps as Polish. 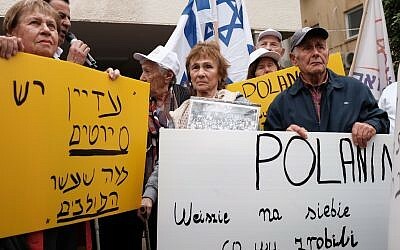 Dozens of Holocaust survivors protested outside the Polish Embassy in Tel Aviv on Thursday, demonstrating against a new law in Poland that criminalizes suggestions of Polish complicity in the Holocaust. 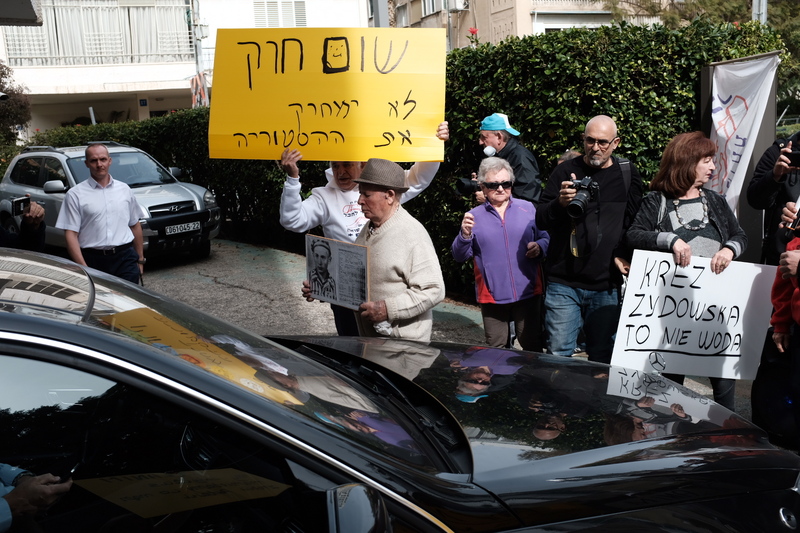 The protest was organized by the Haifa-based Yad Ezer La-Haver foundation, which runs a home in that city for Holocaust survivors. 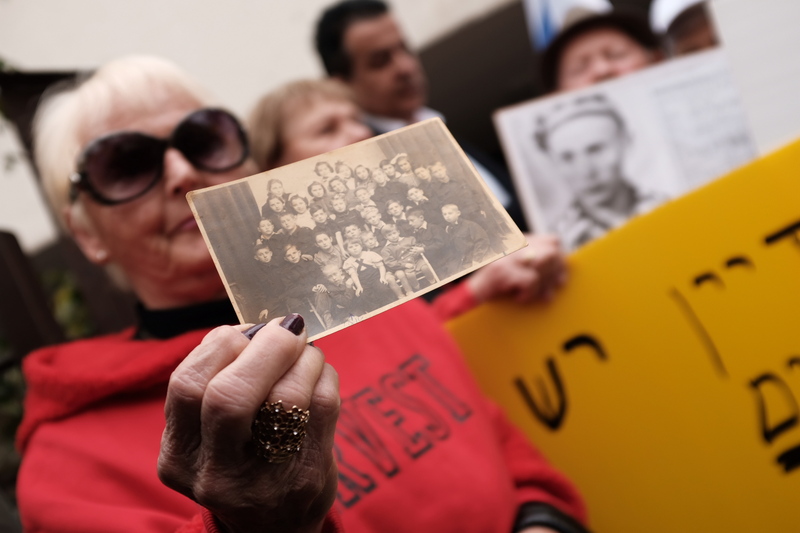 Last week, just hours after the Polish Parliament passed the legislation, a group of Polish-born Holocaust survivors sent a letter of protest to Polish Prime Minister Mateusz Morawiecki. “From first-hand testimony, we say that there were Poles who collaborated with the Nazis and even worse, when the war ended and the Jews returned from all sorts of places where they had lived and hidden during the war, the Poles were the ones who massacred them,” the letter said, adding that the Polish people must take responsibility, immediately cancel the law and compensate the few survivors who are still alive. The protest is expected to grow, as survivors plan to set up a protest tent opposite the embassy and have called on citizens to sign a petition demanding that Poland repeal the law. “We are here to voice our protest, and we promise it won’t be quiet,” said Yad Ezer La-Haver CEO Shimon Sabag. Meanwhile, the International March of the Living announced it would continue holding its annual march in Poland. Earlier this week, Jerusalem Deputy Mayor Yael Antebi called on Education Minister Naftali Bennett to cancel student trips to Poland and move the March of the Living to Jerusalem. Ukraine’s Rabbi Moshe Azman also called on Bennett to suspend school trips to Poland, suggesting the March of the Living be held this year in Ukraine. The organization expressed hope that the Israeli and Polish governments would find a way to solve the current impasse.